Verse 35 tells us that it was evening. The sun has set in this picture, with just a hint of yellow light in the clouds. 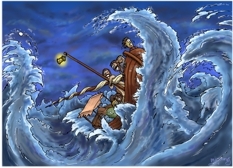 The lantern on the boat’s mast casts a faint yellow glow on the fierce storm waves and terrified disciples below. Jesus is asleep in the back of the boat, you can just see his head and blue outer robe. 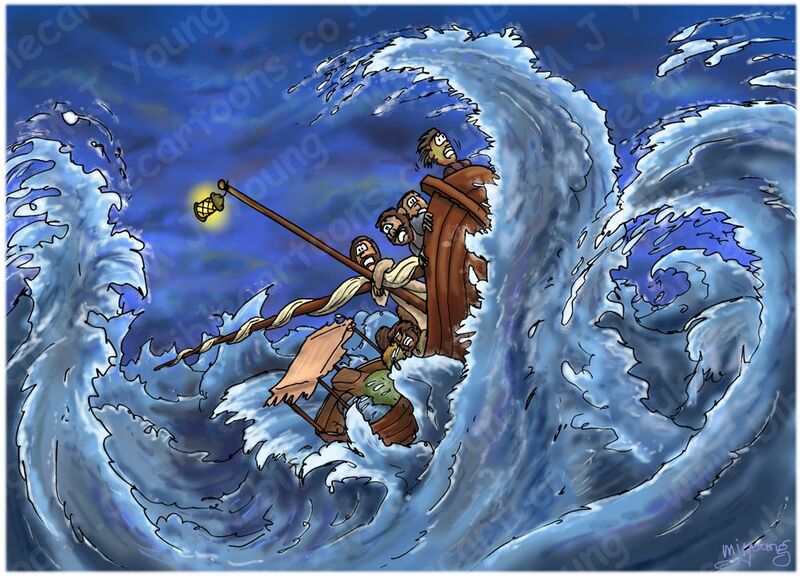 The disciples are all looking terrified as the huge waves of the Sea of Galillee threaten to sink the boat. Matthew (also called Levi) is standing at the front of the boat, looking green with sea sickness. Behind Matthew is Andrew (in purple outer robe), with James’s head (son of Zebedee & brother of John) to the rigth of him. Behind Andrew is one of the three unnamed disciples. John (son of Zebedee & brother of James) is looking very wind-swept, with the remaining two unnamed disciples behind him. Having drawn Mark 04 – Jesus calms storm – Scene 03 – Jesus sleeps (both versions) some years ago, I now feel I ought to keep the same number of people in the boat, for the sake of continuity. This is why I haven’t included all 12 of the disciples of Jesus. I always enjoy drawing and colouring up stormy waves!